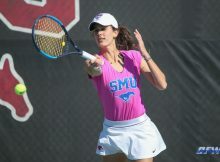 View our photos of SMU women’s tennis at Texas A&M University. 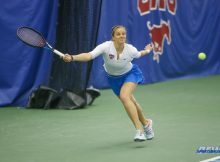 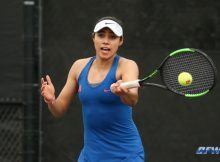 View our images of SMU women’s tennis vs Kentucky on February 24, 2019.
via SMU By Andy Lohman Five times UConn has entered Moody Coliseum in the American Athletic Conference era. 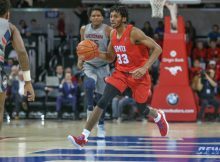 Five times SMU men’s basketball has worn the red jerseys. 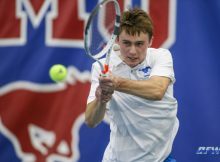 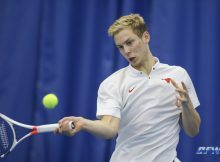 View images from SMU tennis vs LSU match on February 15, 2019. 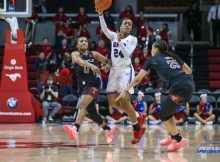 Photos by George Walker/DFWsportsonline. 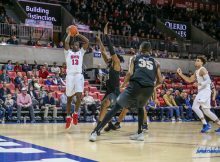 SMU lost it’s 4th game in a row Sunday, falling to Central Florida 71-65 in Moody Coliseum. 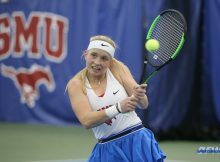 It marks the longest losing streak for the Mustangs since 2012.
via SMU DALLAS (SMU) – The Mustangs completed a doubleheader sweep on Sunday with a 7-0 win over Arkansas-Pine Bluff followed by a 6-1 win against Incarnate Word. 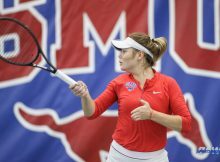 View our photos from the SMU Women’s Tennis victory over USC on February 9, 2019 at the SMU Tennis Complex in Dallas, TX.